Forestry services work occurs nationwide, yet is often hidden from the public eye and is difficult to access by safety and health agencies. Injury and illness rates among workers in the forestry services industry are 2 to 3 times the rates of the average US worker, and fatality rates are 10 times as high. It can be dangerous work, with job tasks involving the use of chainsaws, falling and burning trees and branches, carrying and lifting heavy loads, and frequent awkward and repetitive motions. This industry manages forests for future harvest, reforestation, ecosystem management, and fuel management to prevent catastrophic wildfires. 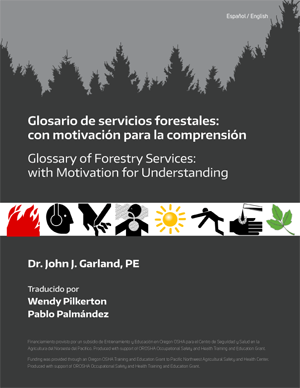 The largely immigrant, Latino workforce in this industry is essential to US forest management, yet vulnerable because of documentation status, lack of English proficiency, low literacy, occupational immobility, working in remote locations under contracted employment, and deficiencies in skills training. Cedar block harvester - one of many varied jobs categorized as forest service work. Our forest and logging research priorities are developed on participation with stakeholders. These materials were developed under an academic-community partnership between the University of Washington’s Pacific Northwest Agriculture Safety & Health Center, University of California Berkeley’s Labor Occupational Health Program, and the Northwest Forest Worker Center. Train your crew with these short but important “Safety Talks.” Real worker stories are used to start conversations and give essential safety tips. Entrene a sus trabajadores con estas “Pláticas sobre Seguridad” cortas, pero importantes. Se usan historias reales de los trabajadores para iniciar conversaciones y dar consejos esenciales de seguridad. Real worker injury stories, told in their own voice, from immigrant workers conducting contract services in our U.S. forests. 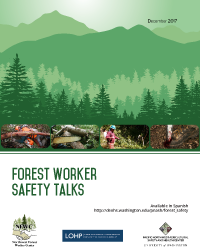 These stories are for workers and trainers with the goal to increase awareness on forestry workforce needs and the importance of safe practices, personal protection, and rights – for themselves and their co-workers. Historias reales de lastimaduras de trabajadores inmigrantes trabajando contratados en nuestros bosques de los Estados Unidos, contadas con su propia voz. Estas historias son para trabajadores y entrenadores con la meta de incrementar conciencia al respeto de las necesidades del trabajador del bosque, y la importancia de las prácticas de seguridad, la protección personal, y los derechos tanto de ellos como de sus compañeros de trabajo.